Howland, ME – Today, federal, state, local, and tribal representatives, and project partners gathered in Howland, Maine, to mark and celebrate the completion of the last major milestone in the Penobscot River Restoration Project: the newly constructed fish bypass around the dam in Howland. Completion of this large stream-like channel will allow American shad, river herring, and Atlantic salmon to swim freely around the dam to and from important historic breeding, rearing, and nursery habitat for the first time in more than a century. 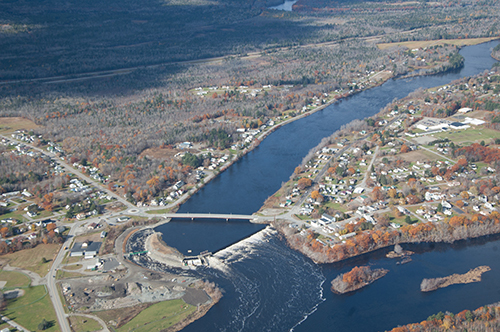 The Howland fish bypass fulfills the Penobscot Project’s goal of significantly improving access to nearly 2,000 miles of Maine’s largest river for eleven species of native sea-run fish, while maintaining energy through increased hydropower generation at other dams in the watershed. The Penobscot Project is widely considered one of the largest, most innovative river restoration projects in the nation. The celebration event, held in Howland at the confluence of the Penobscot and Piscataquis Rivers, features diverse speakers, art work by local students, and a fish sculpture making Howland its first U.S. stop on a world tour of globally significant fish migration sites. “The Howland Dam may seem far from the sea, but it has long kept migrating fish like Atlantic salmon and American shad from swimming between the ocean and their historic inland habitat,” says Laura Rose Day, Executive Director of the Penobscot River Restoration Trust. “This innovative ‘nature-like’ fish bypass reconnects the Piscataquis River to the main stem of the Penobscot and the Gulf of Maine, allowing sea-run fish to swim freely past the dam. Four years ago, in June 2012, the Great Works Dam removal began, followed by the removal of the Veazie Dam at the head of tide in 2013. At the same time, dam owners built a fish elevator at the Milford Dam, now the only dam on the lower Penobscot. Dam owners increased power generation at several other locations within the Penobscot watershed to maintain and even increase power generation. Today, the river is on the rebound. This year, more than 1.7 million river herring have already passed above dams removed by the Penobscot Project – up from only several thousand before the Veazie Dam was removed. Fish are now swimming upriver past Howland and into the Piscataquis and through the Mattaceunk Dam on the Penobscot in Medway, and have been observed more than 90 miles upriver from Penobscot Bay. In addition, a record-breaking 2,700 shad passed by Milford this spring. In another exciting development, last week fisheries experts saw the first American shad in recent history passing the West Enfield dam. New community activities abound. The new national whitewater race, a 4-day event featuring activities from Old Town to Eddington, is entering its second year. An annual alewife festival and children’s days has begun at Blackman Stream in Bradley, where more than 450,000 river herring swam up the stream this past month. Dam owners, conservation groups, tribal, state, and federal agencies, and citizens, worked together for more than a decade to accomplish the Penobscot River Restoration Project, which better balances restoration of native sea-run fish with hydropower generation. The restored river provides many cultural, economic, and recreational opportunities from the Penobscot headwaters to the Gulf of Maine. As a result of the project, the river now better supports Penobscot Indian Nation tribal culture, renews traditional uses, provides major benefits to fish and wildlife, and increases business and regulatory certainty for dam owners. The Penobscot Project also demonstrates how diverse interests can work together to develop results-based approaches to fisheries restoration and hydropower basin-wide. This type of approach could serve as a model for other efforts around the world. Like the overall Penobscot Project, the Howland Bypass was funded through a combination of federal and private sources, with major funding from the U.S. Fish and Wildlife Service’s Fish Passage Program. The Howland Bypass design and construction team included Kleinschmidt, Inter-Fluve, Inc., Haley Aldrich, CES, Inc. and SumCo Eco-Contracting.